There lived a shepherd in a village. He had many sheep. He took them out every morning for grazing. One day, his wife fell ill and he had to go to the city to purchase some medicines for his ailing wife. 'There will be no one to take care of the sheep', he thought to himself. Then he called his son and told him, "Ramu, I'm going to the city to purchase some medicines for your mother. It will take me two or three days to come back. So take care of the sheep. Save them from being attacked by the tigers and wolves. There are many wild animals in the nearby forest. They might kill our sheep." Ramu listened to his father's advice carefully and the next day, he left for the nearby hillside with his flock of sheep. But Ramu was a mischievous boy. He was feeling lonely. So he wanted to have some fun. He stood on a high rock and began shouting "Wolf! wolf!, help." The villagers heard Ramu crying for help. They ran towards the hillside to help the boy, carrying big sticks in their hands. When they reached there they found that there was no wolf. 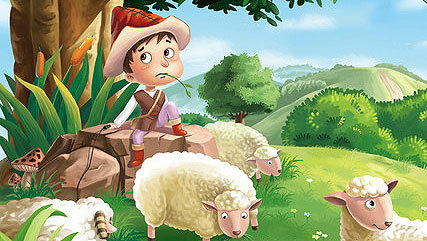 The sheep were grazing happily and the shepherd boy was playing on a flute. "Where is the wolf?" the villagers asked the boy. "There is no wolf here. I was joking," the boy said and laughed. The villagers became very angry and returned to their work in the village. Next day, the boy played the same trick. The villagers again reached there to help the boy. But when they came to know that the boy was lying, they felt highly annoyed and went back to the village cursing the boy. But on the third day, a wolf really came there. The boy got frightened to see his red eyes. The wolf was huffing and growling. He began advancing towards the flock of sheep, gnashing his teeth and lolling his tongue. The boy lost his courage and began trembling with fear. He shouted, "Wolf, wolf, please help!" But to no avail. This time no one came to help him. The villagers thought that Ramu was upto his old tricks. The wolf killed many sheep of Ramu. Ramu returned home weeping.